Large Closet: This space typically holds what would fit in a large, walk-in closet. Small Bedroom: This space typically holds furniture & boxes from a 1-bedroom apartment, and more. $102-$109/month. Rates subject to change..
Large bedroom: This space typically holds furniture from a two-bedroom apartment with appliances, misc. items and cartons. $119-$125/month. Rates subject to change. 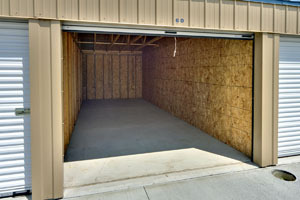 Equal to a 1 car garage: This space will hold furniture from a two-bedroom home with appliances, miscellaneous items and cartons. 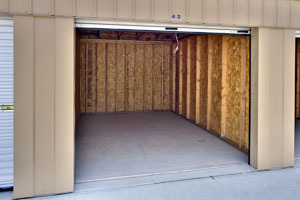 Also may be used to store a car or truck and other small items. These units also have 9' wide doors. $143/month. Rates subject to change. 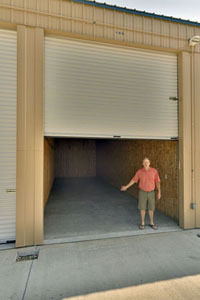 Larger than a 1 car garage: These units are great for boats, cars, trucks, houshold & business items.They have a 9' wide door. $160-$169/month. Rates subject to change. Our largest units have a 10.5' wide by 14' high roll-up door and are capable of storing indoors your larger motor vehicles and keep them out of the snow, hail and rain. A perfect place to store RV's, campers, boats, or just a whole lot of extra stuff. This unit also has 16' high interior walls and can store an entire home. $225-$275/month. Rates subject to change.